LED Color changing Combo Pack. This is the Ultimate package in our combo pack range. If want to Expand your car lighting instruments at a later date...Well, you can do it ALL NOW with the combo pack below. Over 2 Million colors in 1 Kit! 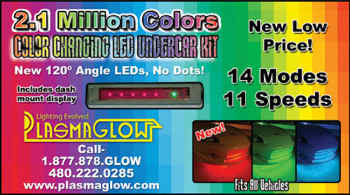 PlasmaGlows 2.1 Million Color changing LED Under Car Kit brings under car lighting to a whole new level! You can hook up the old wheel well kits, interior tubes, even the old color changning kit tubes to this kit, and the old tubes will fade with the new kit. The control box is now able to be hidden under seats or under the dash and you control the kit with a small remote. The remote has the color settings, the mode settings and a new speed setting so you can speed up or slow down the color changing process and the modes. 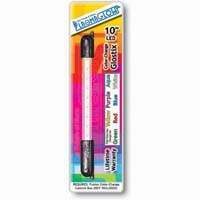 You can make them strobe, chase, scan and color changing effects go faster or slower. There is also an LED strip that has 5 red LEDs that blink to show what mode you are on and a color changing led to show you the color. You can mount this strip on your dash or anywhere convenient. The red leds move to the mode that is on, so if you are on a mode that scans back and forth the led’s in the strip will scan back and forth. The new kit has fewer LED’s but they are much brighter and a wider angle. This actually makes the kit brighter and eliminates the circle effect if the kit is mounted low. The light blends together much better on the newer tubes. We shortened the front and back tubes a little but only because there were some problems with them fitting on some vehicles, it doesn’t effect the glow though. Tired of the dead space in your wheels with your under car kit? PlasmaGlow brings you the perfect addition to your existing 7 color or 2.1 Million Color LED undercar Kit, the Color Changing LED Wheel Well Kit! This kit can hook up to an existing 7 color or 2.1M color changing Digital control box to work with the underbody kit and/or interior tubes, or you can just hook this kit up separately for a bright color changing glow. The Kit includes enough tubes to do all four wheels, and just plugs into your existing 7 Color or 2.1M Color LED Kit Digital Control Box. No extra wiring, or twisting wires, simply mount, plug-in and go! Kit includes: Lifetime Warranty, distribution block and 8 LED tubes. These high intensity LED lightbars mount above your tires in the wheel wells to provide glow where it has never been found before! High impact casing make this a low maintenance addtion, easy to install on ALL vehicles! The Color changing LED Wheel Well kit comes with all necessary instructions and hardware to ensure a smooth installation. Bring the power of PlasmaGlow Technology to your interior with a 10 Inch, 7 Color or 2.1M Color changing LED Glostix Tube! Connect it to your existing 7 Color or 2.1M color digital control box and watch the bright colors cycle and move for a fantastic light show in your vehicle! Also combine these LED Tubes with our new "2.1M Color Under Car Kit" for an unmatched show of light! 10" Color changing LED Glostix Tube. $399.00USD On Special! This week only. Add the Combo Pack to your Cart for $399.00USD. Combo Pack1- Back to Combo Packs.